Conner Millan grabs his skateboard. It’s unusually empty at Venice Skate Park as the sun begins to dip beyond the Pacific horizon. He gets ready to drop in as passersby stop to watch. A curious little boy runs up to Conner pointing toward his leg asking, “What happened? What happened?” Conner stops to explain, in the simplest possible way, that he had an accident. The father apologizes profusely, but Conner shakes it off like it’s no big deal. Conner is used to these kinds of questions. He’s been fielding them all his life. 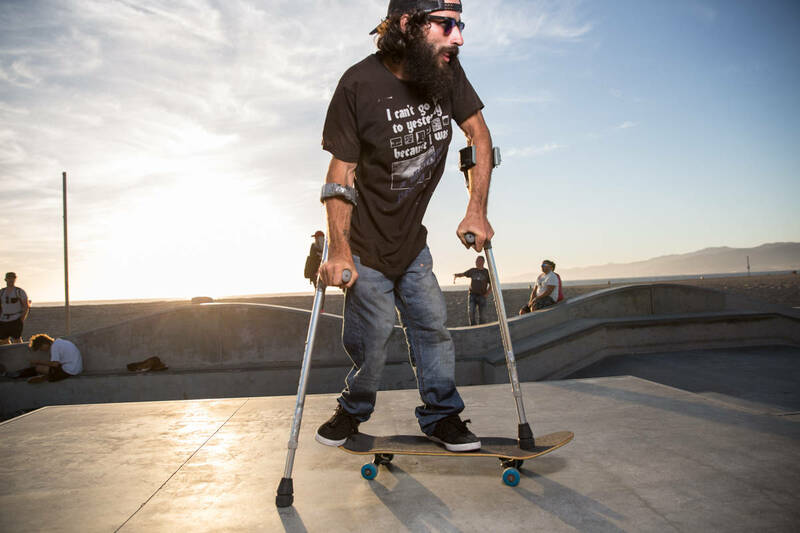 Born with spina bifida, people have often stereotyped his ability to perform common functions and partake in physical activities. Conner laughs while telling me he’s no different than anyone else. According to Mayo Clinic, spina bifida is a rare birth defect in which an infant’s spine fails to develop properly. There are fewer than 200,000 U.S. cases yearly. Now, at 23, Conner has successfully conquered the middle school growing pains and awkward high school teen years thanks, in part, to his skateboard. For most skaters, that first board is unforgettable. Conner received his (a Walmart Spiderman board) as a gift from his mom when he was eight years old. He remembers sitting on it and riding around when another boy his age pushed his way past. “He asked me why I wasn’t standing on it, and from that day on I was determined to learn how to skate standing up,” Conner says. It didn’t take him long. 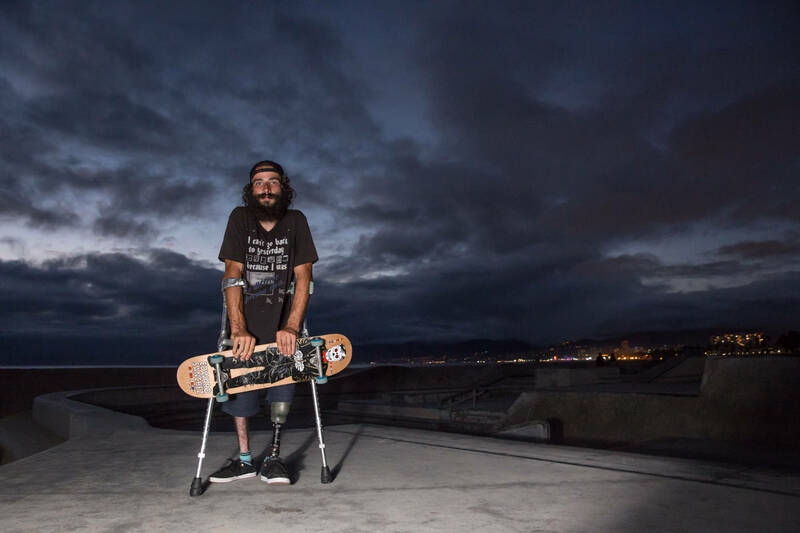 And that was just the beginning of Conner’s unlikely journey: racking of hundreds of thousands of miles on four wheels, two crutches and, eventually, one leg. You just arrived in LA from Florida. What brought you out here? One week here and you’ve already skated Ryan Sheckler’s private park. How did you manage that one? Given your spina bifida, what stereotypes have you had to overcome? Were there any moments growing up when you felt like you needed to stand up for yourself? 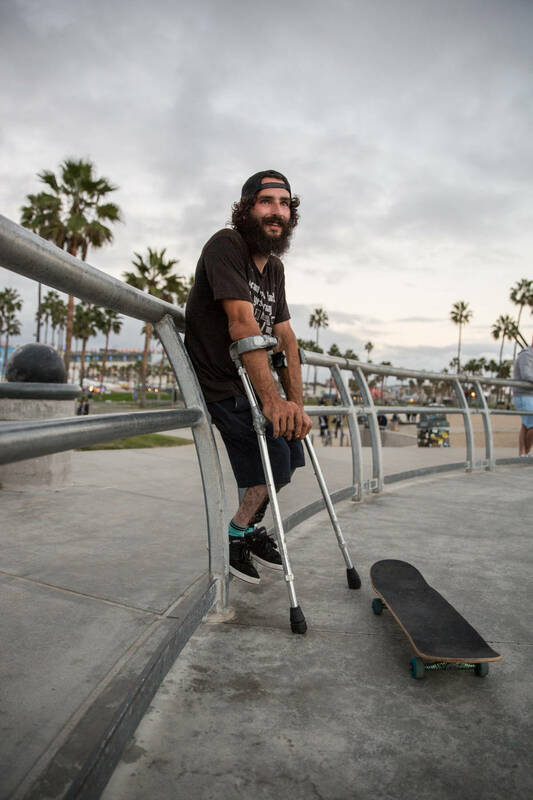 Ironically, you were in a skateboarding accident that required part of your leg to be amputated. Now you have a prosthetic. What actually happened? What was going through your mind when all of this was going down? It was crazy. I didn’t know at the time if I’d be able to skate again. I was in the hospital for about two months. I waited on a prosthetic for seven months after that. My family was my support system. I developed the infection when I was in California and went to the hospital out here. They pretty much gave me a pill antibiotic and sent me on my way. I skated out of the hospital with a hole in my foot. I decided to go back to Florida where I was covered by insurance and my family’s at because I knew it would be a longer recovery time. There was a GoFundMe campaign set up to help you pay for the prosthetic. Who started that? The page is still up. What are you collecting the new funds for? What’s it like having a prosthetic? At first, it wasn’t too hard to get used to, just like building the muscles back. After that, the only remaining issue is the sweat factor. [laughs] The rubber cup that holds the prosthetic on isn’t really breathable. If I sweat, it slides down. 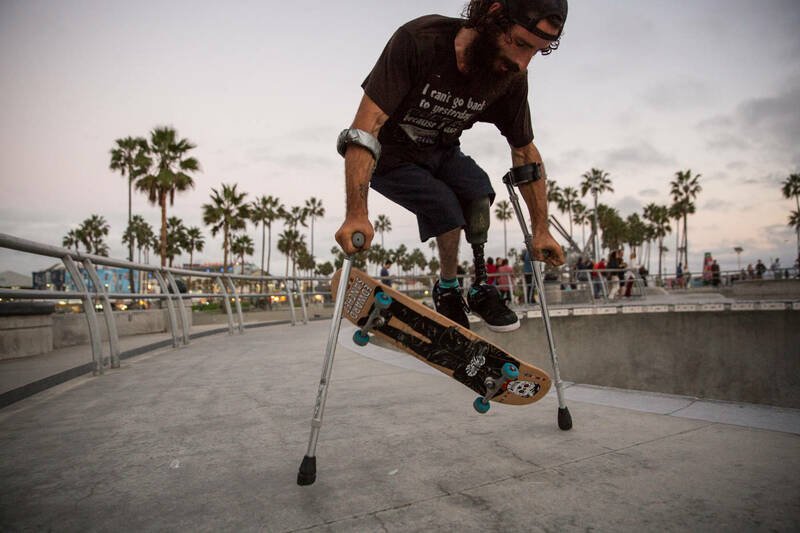 I’ve talked to my friend’s buddy who’s also an amputee that skateboards. He told me try deodorant or baby powder. Because of spina bifida, I couldn’t move my ankles or toes anyway so learning how to skate with a prosthetic wasn’t too big of a change. I had to get used to the weight of the prosthetic and the stiffness of the ankle piece—nothing that took longer than a day or two to get used to. What do you want to tell people about spina bifida? This is honestly a hard one to answer. [long pause] I want to be able to spread more awareness about spina bifida. Not all forms can be visually identified or seen from an outward perspective. There are a lot of misconceptions about it. I don’t experience any pain or soreness except from skateboarding over the course of the day. My case can be very different from other spina bifida cases. There isn’t a lot of accessible information, and I’d like to be able to change that. Look out for Conner in 2017. 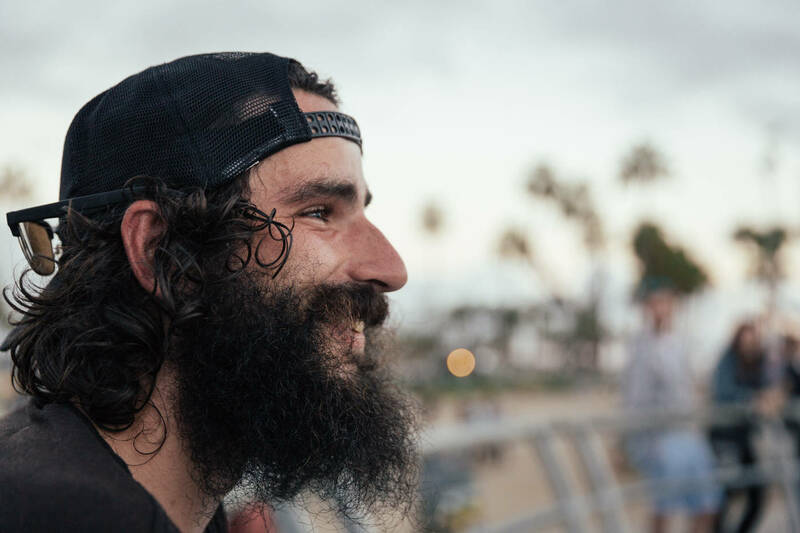 This skateboarding vagabond is hitting the road in a van and traveling across the States to skate as many places, and meet as many people, as possible. For more information, visit Conner’s GoFundMe page here.